After a year of producing and publishing, Keyframe prepares to expand its network and grow the "ReInhabiting the Village" brand. Keyframe-Entertainment is a San Francisco-based company that produces, finances and distributes cutting-edge projects by forming strategic partnerships that generate growth for its clients and partners. The 2015 year began with a successfully funded Kickstarter campaign of Jamaica Stevens’s “ReInhabiting the Village,” a multi-media community resource project co-created by an alliance of over 60 visionary partners sharing their knowledge and experience. Campaign backers include prominent members of the Transformational community such as Producer, DJ, and Vocalist ALIA; Filmmaker Ian MacKenzie, pioneer Coyote Alberto Ruz, Electronic musician and ardent Permaculture proponent The Polish Ambassador, as well as sponsors Festival Fire, North Atlantic Books, Beloved Festival, Lasers and Lights, Flow Fests, IgNight Conference, Yellow Seed, Kinnection Campout and Village in a Box. The Kickstarter campaign rewards have since been fulfilled, culminating in the creation of the “ReInhabiting the Village” project website, the print book, workbook and ebook. The project was also featured on Uplift Connect and Fest300. Keyframe is the Executive Producer of the project and Lucidity Festival supported as Associate Producer. Learn more at http://reinhabitingthevillage.com/. As a partner of Festival Fire, Keyframe supported the publication of the 2015 Festival Fire guide. Created by Saphir Lewis, Festival Fire is a site that features resources including Transformational festival guide, store, festival calendars, blog, and services. In January, Keyframe released the Wisdom of Shankara through its music label. The Wisdom of Shankara (Brendan Evans and Elijah Wilson-Kelly) is an electronic music duo from Lyttelton, New Zealand whose music features hypnotic bass lines, ethnic melodies, deep tribal energy and psychedelic dub effects. 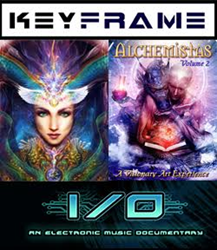 In March 2015, Keyframe sponsored ALIA’s “Feminine Medicine” project, an original music album and stage show project created to showcase more female artistry in the electronic dance music industry. The project was the result of a successful Kickstarter campaign that raised $20,305, surpassing its goal by 35%. ALIA is a San Francisco-based Producer and DJ of sacred sounds that bridge ancient frequencies with cutting-edge bass, and is also a featured author in the “ReInhabiting the Village” book. Keyframe also sponsored Lucidity Festival, which featured permaculture courses and permaculture proponent headliner The Polish Ambassador. Lucidity Festival LLC is a collectively owned organization dedicated to creating Transformational experiences for individuals and communities; a production company, a creative lifestyle brand, and an interconnected community of friends and family. Its mission is to strengthen community through the fostering of the following values: Participation and immersion in the artistic process, Personal growth and global healing, Awake and aware consciousness, Environmental and social responsibility, Family fun and creative play, Communal reciprocity, and Transparency. Jonah Haas, Director and Co-Founder of Lucidity, is also a featured author in the “ReInhabiting the Village” book. This year Keyframe worked with Music Producers MetaTek and Dissølv. JB DeVries, better known by his stage name MetaTek, is an American DJ and Producer living in San Francisco. MetaTek has performed at the Transahara Festival in Morocco and a multitude of Bay Area, Los Angeles and Seattle events. As a longstanding member of Burning Man sound camp Opulent Temple, he has performed alongside artists such as Carl Cox, Christopher Lawrence, and The Crystal Method. Valentin Santana is a Santa Cruz-based Music Producer with two Electronic Music projects: Dissølv and Calibrate. Dissølv features a Future Bass sound with deep organic Dubstep and live instrumentation, and Calibrate is a sound healing project featuring nature soundscapes and harmonious melodies. Valentin has performed at many transformational festivals and venues, from the San Francisco Warfield and Fillmore theaters and Opulent Temple. He will also be at the 2015 Cosmic Convergence Festival in December. In May 2015, Keyframe supported efforts by psychologist, author, and radio show host Dr. Kelly Neff in launching the Lucid Planet Radio on Transformation Talk Radio. Dr. Kelly Neff is also the founder of The Lucid Planet platform, a wellness and personal transformation website. Her articles on psychology, transformation, and wellness have reached millions through websites like The Mind Unleashed, Mind Body Green, Wake Up World, My Tiny Secrets, and Elephant Journal. In November, Keyframe signed on as Associate Producer of the Electronic Music documentary “I/O.” The I/O (input/output) computing term is defined as the relationship between an information processing system (such as a computer), and the outside world (such as a person). I/O is a reflection of the communication between electronic music and the people that connect with it. Filmmaker Kevan McGovern unveils the truth behind why this music genre and its culture shift consciousness and lifestyle in ways that are completely distinct to other music genres. This film presents a thorough examination of the cultural anthropology behind electronic music. In November, Keyframe joined the conscious Hip Hop group the Luminaries in launching their Indiegogo campaign for their film, “When The People Lead: A documentary about the Luminaries’ travels to Palestine & Israel.” The documentary will shed light on the Luminaries’ joint delegation work with Citizen Diplomacy Initiative to educate the masses about tensions in the region and promote peaceful collaboration through art and music. “Keyframe is honored to be supporting so many creative, talented individuals who believe in the impact of doing good in the world and promoting sustainable solutions of co-creation and sustainable growth,” says Julian Reyes, Keyframe CEO. In 2016 Keyframe plans to continue growing its partner network, and expand the growth of the “ReInhabiting the Village” brand by publishing the book worldwide. To learn more, join the Keyframe Facebook page here: https://www.facebook.com/keyframe.entertainment/. Keyframe-Entertainment produces, finances, and distributes cutting-edge projects by forming strategic partnerships that generate growth for its clients and partners. By INSPIRING, INFORMING and ENTERTAINING through film, electronic music, visionary art, community building, and Transformational Festival culture, Keyframe aspires to create global positive change. Keyframe also offers marketing support and strategic networking to DJs, producers, companies, filmmakers, nonprofits, and festivals.